I am in Las Vegas at the moment for the IT/DEV Connections conference which will take place in Las Vegas this week. Looking at the schedule and list of speakers, the conference is bound to be a success. If you’re not in Las Vegas, you can follow the conference on Twitter. The designated hashtag is #ITDEVCON. 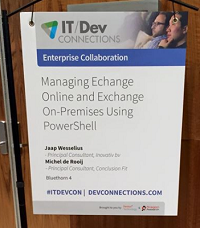 Many thanks to Penton Media for giving me the opportunity to co-host the “Managing Exchange On-Premises and Exchange Online with PowerShell” workshop in the Enterprise Collaboration with Jaap Wesselius, on September 14th in Bluethorn 4. I will be present at the conference the whole week, so if you have questions or just want to say hi, look me up or ping me on Twitter or e-mail.